A huge fire has broken out at Jomo Kenyatta International Airport, the main international airport in the Kenyan capital, Nairobi. The Kenya Airports Authority (KAA) said Jomo Kenyatta International Airport (JKIA) had been closed and passengers evacuated. Cabinet secretary for transport Michael Kamau said the fire was “very severe” and urged people to stay away from the airport. Images showed flames raging from one of the main buildings. The interior ministry tweeted that an evacuation of the entire airport was under way, with only essential personnel remaining, but said the fire had been contained. There have been no reports of any casualties and the cause of the fire is not clear. JKIA is an important regional hub for East Africa, with many long-distance flights landing there to connect to countries across the region. Dark smoke could be seen billowing into the sky across much of Nairobi as the fire – which began at approximately 05:00 local time – took hold. Shocked would-be passengers stood outside the airport, bags in hand, watching the blaze. Multiple reports say the arrivals and immigration sections have been devastated by the blaze. 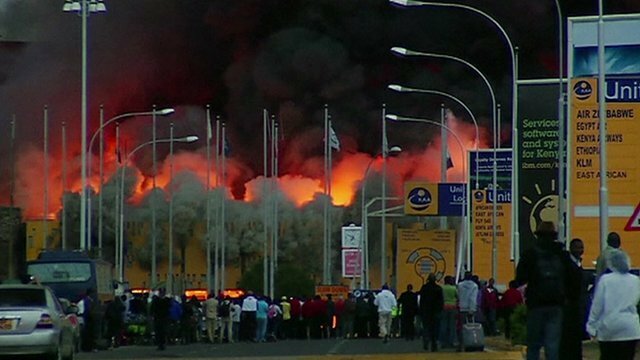 Mutea Iringo, a senior official at the interior and national co-ordination ministry, earlier confirmed “a serious fire” at JKIA, adding: “We are doing everything possible to avert a crisis. Cabinet secretary for transport Michael Kamau urged people not to obstruct the work of the emergency services. The KAA said only emergency vehicles were allowed in the area. The blaze comes two days after aircraft were delayed for several hours after the failure of a hydrant needed for refuelling planes. It also comes 15 years to the day after attacks on the US embassies in Nairobi and in Dar es Salaam in neighboring Tanzania killed more than 224 people – though there has been no suggestion that terrorism played any role in this fire.